Ardustation is the new Portable Open-Source Ground Station (Arduino and Xbee Based). d some holes near to the antenna so you can hold it with a strap). Wireless programing: You can use XBEE to program it (needs 2n2222 transistor available at any electronics store). Can be powered with 2 and 3 cell LIPOS (diode protected and regulated). There is a large 4 line screen which has a backlight, very clear under the sun! (2 pots to control the backlight and contrast). FTDI port to upload code, also the boards is ready to be programmed with XBee. Six button to navigate and change screen and options. Very noisy buzzer that can be used to alert you when it has low battery or low altitude. 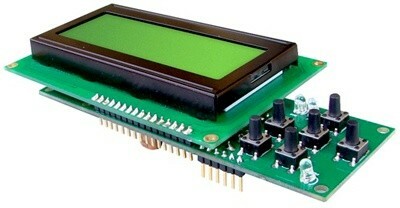 6 I/O analog pins available, including the I2C port. 2 powered SERVO OUTPUTS (Tilt & Pan) that can be used to control a directional antenna (NICE!). Extra 3.3V and 5V volts outputs. Status LED's. The software is ArduPilot compatible and Open Source. ArduStation is your robot's best friend! NOTE: Some assembly required, FTDI cable is required for programming. When programming the Ardustation please make sure you select the "UNO" or the code will not load.